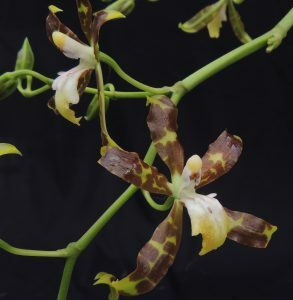 This lovely Oncidium is new to 365 days as the plant we have had for many years was divided a couple of years ago and is now back to flowering size. Oncidium maculatum is native to Mexico and Central America where it grows in wet forests from 1000 to 2000m altitude. 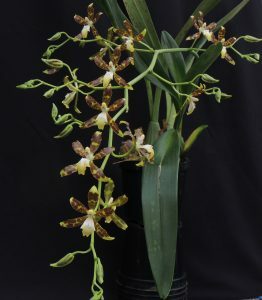 This habitat suggests it would be happy in either our Warm Americas or our Cool Americas sections and we have grown it in both although we have found that plants do best in Warm Americas where we keep plants wet and in relatively bright light which encourages the large pseudobulbs that flower well. We grow the species successfully both in pots and in baskets. The flowers are long lasting and large compared to most Oncidiums making this a really attractive species and one we have used in breeding.